A Pale Canadian has moved! This is in no way a comprehensive list of all things yummy in Japan. This is merely a rambling of some of the tasty food we ate when we recently visited. Coming from Toronto, a city as multicultural as you can get, most of this stuff wasn’t new to us but I was amazed by the quality, style of preparation and in some cases the availability and convenience of the dishes. Let’s start off with foods at your local convenience store. You would never think of stopping in your local 7-Eleven for sushi, a cheeseburger, or fresh three cheese ravioli with mushroom cream sauce. The very least you’d get is a sloppy sandwich with sandwich meat of a questionable expiration date, soggy bread and gross tomatoes. Maybe you’d opt for a bag of Doritos or instant noodles. Either way, this is the extent of convenience store gourmet food in North America. Not in Japan. They’re jam packed with ready to eat and heat n’ serve delicious, fresh ingredients and dishes. Take for example Onigiri which is rice balls usually filled with delicious goodness from raw or cooked fish, egg or red bean paste and surrounded with crisp nori. 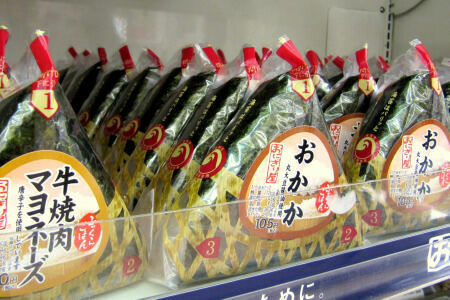 My favourites were the ones in special ‘peel-by-numbers’ wrapper which kept the nori crisp. So simple, yet you’d be hard pressed to find something as fresh and nutritious as this in a convenience store in North America. Here’s a detailed recipe on how to make Onigiri from Japanese Cooking 101 if you’re interested. I plan to make these this weekend! Calpis Water. Get on this Coca-Cola North America! Technically I didn’t discover this next item at a convenience store but it’s a very popular local beverage especially during Cherry Blossom season. 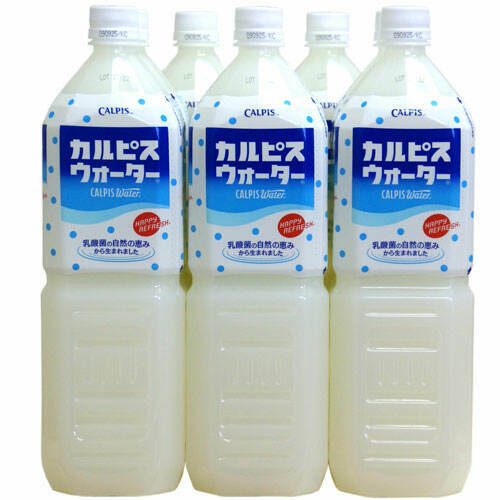 Calpis Water, a non-carbonated drink made from milk and lactic acid, was discovered by Kaiun Mishima when he travelled to Mongolia in 1902 and saw locals drinking a type of sour milk. The drink seemed to aid his own digestive problems and when he returned to Japan, he brought the drink that is now so very popular. Sounds weird, right? Fermented lactic acid drink? Certainly nothing that I’d want to drink but it’s delicious and sweet and only now I realize how good it is for you. I guess the sweetness made me think that it was completely void of any nutritional value but the company claims the fermented lactic can aid in digestion. Either way, it’s yummy. Royal Milk Tea, served hot or cold. Japan can get pretty chilly in the winter and there’s nothing better to warm you up while you’re waiting for the Shinkansen than a hot tea or coffee. All over Japan you’ll find vending machines that sell hot beverages. 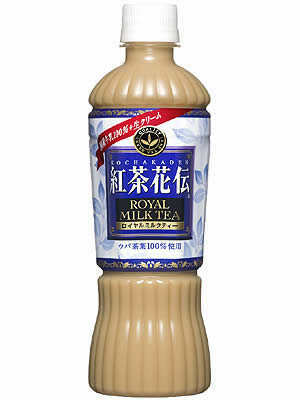 One that I fell in love with is royal milk tea. I’m not sure why North America beverage manufacturers haven’t got on board with milky tea, either served hot or cold. There’s tons of ready-to-serve iced coffee drinks in North America but no tea! Screw coffee!! Coffee is gross. Let’s get moving on this multinational beverage companies … Coca-Cola, I’m looking at you! You have the market locked up in Japan, let’s branch out to North America for all those tea drinkers. A refreshingly cold or warming milky tea is just what the Canadian public want. Timmy’s serves already brewed hot tea. I’m not saying … but I am saying. Get. On. It. Now. Though the ramen noodle originated in China, Japan has made it one of its own. We visited the Ramen Noodle Museum in Shin-Yokohama, which in my opinion is just a trumped-up spot for a few ramen restaurants with a gift shop attached to it. 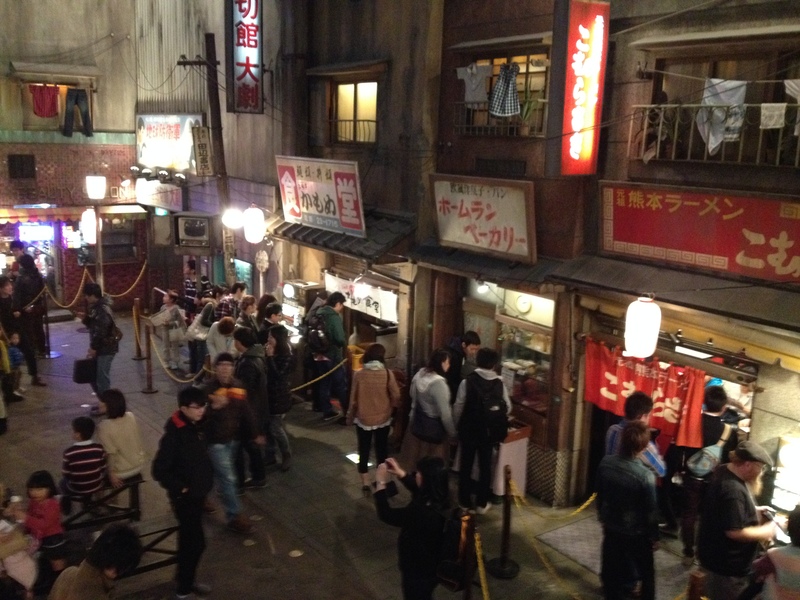 No one really should go for the gift shop; they should go for the choice of nine restaurants all serving their style of unique ramen dishes all fashioned around a WWII Japanese setting. Fresh ramen is soooo much tastier than the instant stuff. Japanese ramen shops take great pride in their noodles and especially their broths which are cooked for hours and can never be replicated by the freeze-dried, powered stuff. We went to the Sumire noodle shop known for their rich, flavourful miso noodles and broth. Very cool and very tasty place to try a lot of ramen dishes all in one spot. 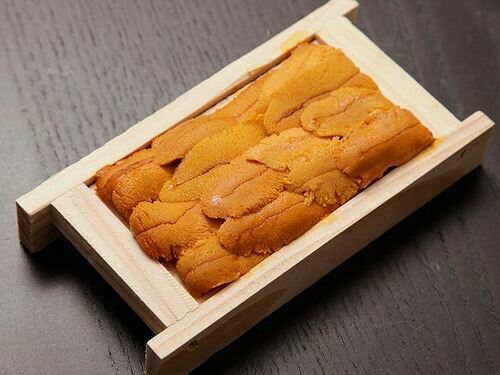 We’ve always wanted to try uni (aka sea urchin) but it never failed that when we were at a sushi restaurant and saw it on the menu it was always in the off-season. This time we were in luck and we tried it three times. The first time we tried it at a sushi train in Osaka. It was one of the foulest experiences I’ve had in my life. It tasted like dirty garbage sea water with rotting fish and it had staying power. No amount of sake would take that away. When we met up with friends in Tokyo, they saw it on the menu and thought we should try it. We told them how uninterested we were in ever tasting it again but they assured us that it didn’t taste like that normally and that you get what you pay for (we got our first serving pretty cheap). Convincing us to try it again, we tasted such a delicate flavour and texture. Everything was different from our first experience. I would highly recommend trying uni but remember: you get what you pay for. Quality is everything with uni. It’s not a flavour for everyone but definitely worth a try. We were very fortunate to have a home cooked meal prepared by my brother-in-law’s mother-in-law (if that makes sense). 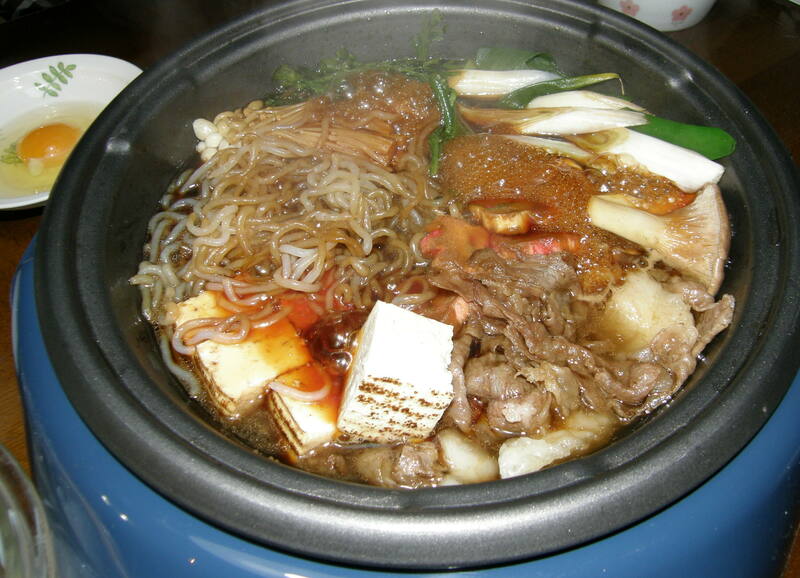 We called her Mama-San and she made us sukiyaki, a hot-pot filled with love. Cabbage, tofu, sliced beef, enoki mushrooms, noodles, were spooned into our dishes that had a freshly cracked and beaten egg in it. When the fragrant hot broth and ingredients hit the egg, it became this velvety-smooth mixture of pure deliciousness. When we walked in to their house all you could smell was the aroma of the dashi-based broth with a hint of sweetness from the sake, mirin and sugar. It was heaven. Arigatō Mama-San! Pork katsudon wasn’t anything new for us but it is just delicious and needs a proper shout out. For those who aren’t familiar with the dish, it’s a fried piece of pork (or chicken) cutlet, served over a bowl of rice with an egg. 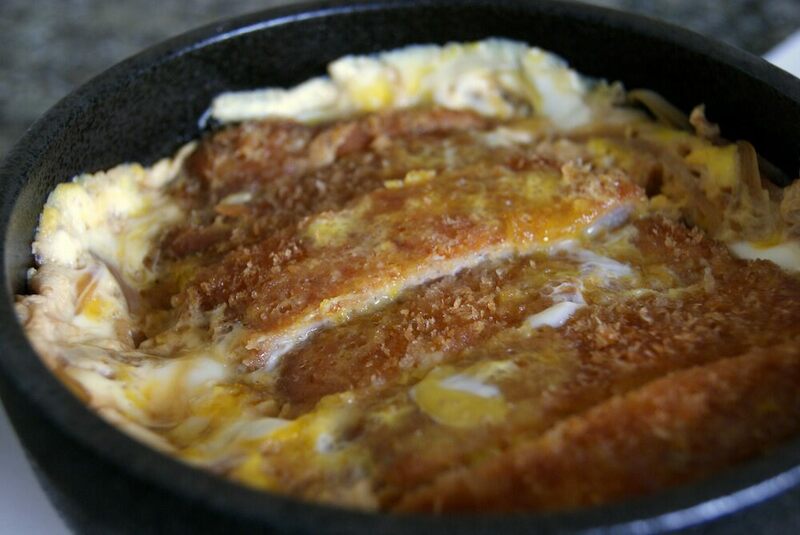 The katsudon I’ve had in Canada was will a fried egg with a runny yolk so that you can incorporate the yolk with the rice and the bit of katsudon sauce creating something epic. In Japan we had it served two ways: with the sautéed chicken breast it was served just barely cooked and then pretty much raw with the deep-fried pork cutlet. Depends on how comfortable you are with consuming raw eggs. Nothing hard to do, nothing too complex, just simple delicious food that kept me full for over eight hours of walking around Osaka. For a really comprehensive list of yummy Japanese dishes, check out Japan Talk’s “101 Kinds of Japanese Foods”. It’s so true! Japanese snacks are the greatest and don’t only come in one sweet variety. They have an abundance of savoury and sweet treats that will just blow your mind! A toe in the water, now I am upto my neck. Memoirs about sweet and seasoned things with a bit of flair. Health, Fitness, Nutrition, Yoga and More! The TD Kitchener Blues Festival is happening August 7 to 10, 2014.